Following the earlier article on the challenges of surface water alerting, Peter Buchanan discusses emerging science developments being used by the flood forecasting service in Scotland. “How does the Heavy Rainfall Alert tool work? In essence, it searches for instances of heavy rain in these weather forecasts up to 36 hours and identifies possible events stratified by threshold and warning area. The HRA tool will also provide a start time, average and maximum rain accumulations associated with the event, and a probability of occurrence. How does it do this? On the assumption that no one forecast of a given heavy rain shower can be taken literally, the HRA tool uses a number of alternative, forecast scenarios to account for the range of possible outcomes. Where does the HRA tool get its data from? For the time being, it uses the output from a configuration of the Met Office’s numerical weather prediction, designed to make predictions over the UK. This model has the capability to represent individual large showers and thunderstorms. Predictions out to 36 hours ahead are made every 3 hours. Over lapping portions of successive, 3 hourly predictions are used to produce the range of forecast scenarios mentioned above. Making the assumption that older forecasts will tend to be inferior to more recent forecasts, the HRA tool estimates the likelihood of exceeding a given heavy rain threshold. In conclusion, the HRA tool is not a panacea for the forecasting of surface water flooding but it will help alert us to possible impacts in specific areas and provide guidance on the associated likelihood of occurrence. SEPA, the Met Office and the flood forecasting service in Scotland are committed to a steady improvement in the surface water flood forecasting capability and the HRA tool is a significant step on that road. So where do we go from here? 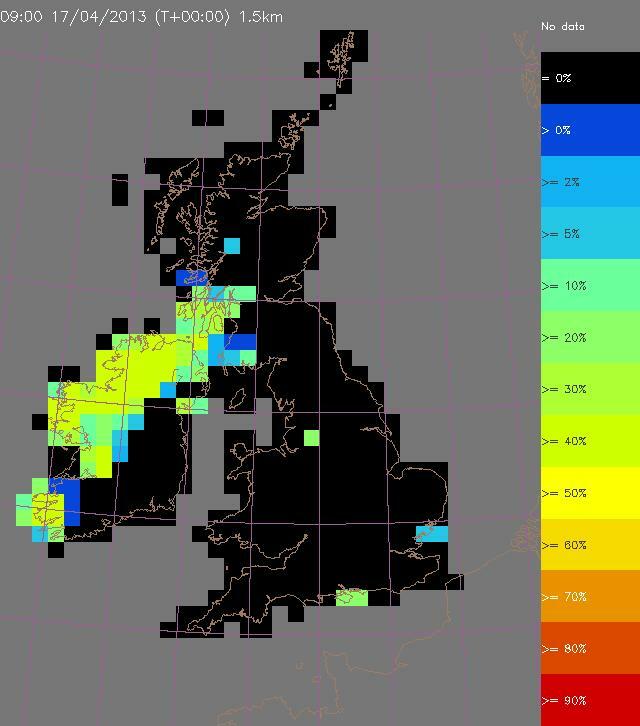 By 2014, the HRA tool will obtain its rainfall forecasts from a state-of-the-art configuration of the Met Office’s numerical weather prediction model known as MOGREPS-UK (Met Office, Global and Regional Ensemble Prediction System). The main benefits of this model will come from an increase in the number of alternative forecast scenarios (12) it produces. This should enable the uncertainties associated with forecast heavy rain to be better quantified. The longer term prospects for better prediction of surface water flooding events remain good, with various research projects (meteorological and hydrological) in the pipeline together with further developments in the associated science, technology, observing systems and computational power. This entry was posted in Forecasting, Probabilistic, Weather prediction. Bookmark the permalink.